This Whole 30 Review is not done without trepidation. I have good friends who swear by this diet and I would hate to anger them. 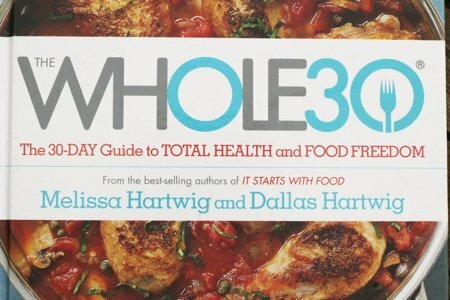 In case you haven’t heard about it, The Whole 30 is a best selling diet book that attempts to set you on a path to Total Healthy and Food Freedom (in 30 days). Ambitious? Perhaps, but the people who wrote it, Melissa and Dallas Hartwig are nothing if not ambitious. The Hartwig team is a pair of certified sports nutritionists (not doctors) and they believe they have found the answer to our weight loss problems. Before I go further, I can tell you that I wish they had figured it out. I don’t want to put down their ideas and say that this diet is not revolutionary – I want the Whole 30 to be different than the average fad diet. No added sugar, alcohol, grains, legumes, dairy, carrageenan, baked goods, or scales. Can you guess which one I like? No scales of course! It is a good idea to start out on a healthier diet without a constant (sometimes daily) measurement of your success. I think that you could find that healthier food changes your mood or energy level. A scale only measures pounds and can derail you if your number starts to go a wee bit up. The other part of that list leaves me cold. They are ruling out some nutritious food in this diet – yogurt, whole grain bread, quinoa, peanut butter, and black beans for example. Sometimes I eat a bowl of brown rice, black beans, a little melted cheese and salsa. This entire meal is forbidden. Is it really unhealthy? I would argue that I am doing much better than a Big Mac with fries. The Whole 30 has so many restrictions it would be almost impossible to eat out or dine at a friend’s house without making a scene. 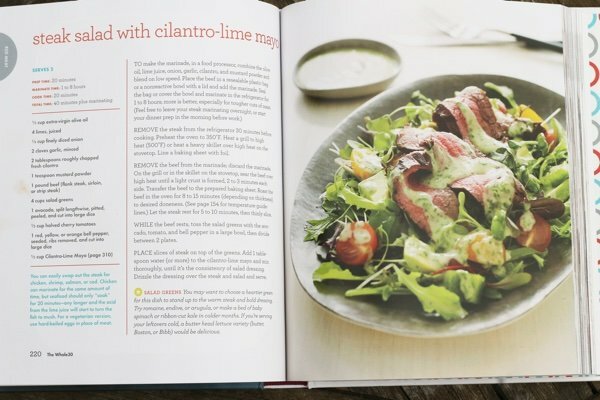 One thing that I liked about the book are the healthy recipes. They are filled with vegetables and (you guessed it) whole foods. If you are looking for “gourmet” this is the wrong book as the recipes are pretty basic. They don’t use anything “artificial” and they don’t include calorie counts (which I think is a good thing). Overall, I think that the Whole 30 diet is unrealistic and not practical for how most of us live and eat for 30 days. The authors state that you MUST GIVE THEM 30 days for the change to happen or you have to start again. I find it hard to believe that if I use ketchup (added sugar) on my burger on day 20 that I have ruined the plan. I believe you can reboot your diet with far fewer rules about what you put in your mouth for a shorter period of time. For example, you could rule out added sugar for a week and see how things change. In a true elimination diet, you stop eating one food group at a time and monitor the results. There is no empirical evidence - scientific studies - that show that this diet will change you. The authors state that hundreds of thousands of people have been through it but have they studied what happens before and after - and showed us how much better it is than the diet that we already eat? Finally, what about the Whole 30 could hurt you? Could it be detrimental to your health? I would argue that if you are unable to complete it - you could have an emotional reaction that could lead to more unhealthy eating. Why try to eat anything healthy when you can't do it? Hello, one dozen donuts! What do you think of the Whole 30? Does my review help or hurt? As the people above said, this is a temporary elimination diet to see if you are reacting to some things you normally eat. It is not presented as a long-term thing. It was difficult but eating breakfast out was possible (eggs, potatoes, veg). It did not make a huge difference for me and I'm rather glad because I didn't want dairy to be the cause of my bad skin! But some people have a huge change in how they feel and figure out some dietary intolerances they wouldn't have otherwise. I suggest you try it for 30 days and then review it again. My Dr. keeps recommending this diet. I bought the book last year, looked at it and said NO WAY....that's a diet and couldn't live by it. I joined WW and staying my own course on the PP program, lost 22 pounds so far and still going. Doing it slow and steady so I can actually LIVE like this for the rest of my life! Thank you snack girl, a lot of your recipes from your book are ones I use now. Love your blog! This is not realistic at all. I dont like that they have cut out grains, beans and dairy. Those are all very healthy for you. This might be ok as a cleanse but it is not sustainable as a way of life. I hadn't heard of this book until now. It sounds like a good way to get folks in on the healthy whole foods bandwagon. Though unlike you, Lisa, and this book, I'm very fond of my scale! My scale keeps me within a 5lb fluctuation; its second nature for me to step on it every morning coming out of the shower. Back when I needed to lose 25 lbs I even charted my loss to feel good looking at the overall trend. That visual kept me from complete discouragement if I had slipped up. For years, I kept re-setting my ''start diet'' day, and it was always a Monday. Sound familiar? But looking at my scale AND chart and seeing even a wee bit of success made me continue the diet immediately after any ''slip up''. When I reached my goal, the scale kept me there and still does My personal diet food included all the good stuff we all know about by now, but in moderation; 4ozs lean protein, lots of fruit and vegs, limited fat and starches, 2 snacks. Through weighing myself and my food and charting I learned that I could eat 1 meal ''off diet'' about every 4-5 days and not stop losing! Two meals out of 21 per week never affected my rate of loss, it actually kept me from entering the body's need to store fat, sometimes referred to as ''plateauing''. I tell my stressed out WW friends my story about how 1 or 2 meals ''off diet'' out of 21, will do no harm, and releases that restricted feeling while getting creative with mostly a whole foods lifestyle. [however that does not mean a total binge, just a meal.] I gotta quote Michael Pollan again and again, cause he nailed it when he said, ''eat food, not too much, mostly plants''. Your rice and beans, bit of cheese, and salsa sounds so yummy and satisfying for lunch! A little coriander and cumin and its a Mexican feast! I'm a little disappointed in you, as it seems that you read a small snippet of the book to form your opinion. The authors are very clear that it is a 30-day way to get your body back into alignment. They state that it is NOT a way to eat 365 days a year because we are human and want to eat out, socialize, have a treat, etc. Their predecessor book "It Starts With Food" explains why they want you to eliminate those particular items FOR THIRTY DAYS. After that you can reintroduce them into your diet as you determine how your body is reacting to each of the groups. You aren't giving up dairy, legumes, and grains forever. My husband and I are in the midst of our first Whole30 (we are on day 17) and I can honestly say that it has changed the way I look at food, plus the rules are clear and easy to follow. Before, I was a label-reader, looking at the nutritional stats. Now, I read labels and also look at ingredients. Becoming more conscious of what we are putting in our bodies is a theme you follow in your posts - which is why I follow your blog! I'd encourage you to read the ENTIRE Whole30 plan to get the bigger picture. Just like other programs you are supportive of (e.g. Weight Watchers), this is a way to improve your nutrition and change your lifestyle. Isn't that what you are aiming to help us do? I agree with Lee's comment! The Whole 30 is a way to give your body a rest and introduce new ways to eat healthy and better. Eliminating all sugar and processed foods is the key. Get back in the kitchen and cook. As she said, it starts with food! You can start adding back in and see your own bodies reaction to those things once eliminated and then added back in. My comments echo many of the others - you haven't done your research. The Whole30 program isn't a diet, it's not a weight loss program, and it's not intended to be followed long-term. It's more of a learning tool than anything. I also agree that you need to read the whole plan before "reviewing" it, because to anyone who knows Whole30, you are coming off as extremely uninformed. I've read a lot about Whole 30. I was looking into it to help with my husband's chronic skin conditions. Whole 30 is not meant to be a diet to lose weight, and as others have said it's not meant to be a sustainable diet. It is a really extreme way to eat - but only for 30 days, and meant to help see how different foods effect your body. So no, I do not think you should use this as a method of losing weight, or an everyday way to eat. I think you give really good, sound advice most of the time, so I'm really surprised that it looks like you didn't really do through research here. Or at the very least, didn't give the full purpose of way of eating. I did read the book but maybe the problem is that I didn't read "It Starts With Food". I don't agree that 30 days on this elimination diet is a solution to many people's weight loss or health problems. There are other less strict "reboots" for shorter periods of times that are much kinder and can help. I don't think that the Whole 30 -30 days is sustainable or practical or realistic. I will revise my review so I am clearer. This program may not be detrimental to my physical health but it sure would be detrimental to my mental health. Not something I would ever do unless my actual health were in danger and this would save it. I'm all about moderation but feel we're all different and that some would embrace and benefit from this plan. Just not me. I initially thought my friend was crazy for talking about the Whole 30 program she was trying. Until one day, I had plain Cheerios and milk for breakfast. Within 15-20 minutes after eating it, I felt so terrible I wanted to go back to bed. So I thought I will give this Whole 30 thing a try. Today is day 24 and I'm feeling awesome, I'm never hungry, my cravings for unhealthy food are greatly decreased and I have more energy. I know this eating plan isn't sustainable, and when it's over I will have a better relationship with food and think twice if I want to eat something healthy because I know I won't feel better afterwards. I think people are on both sides of the fence with the Whole 30 thing- in the end it's what ever works best for you. I know this eating plan isn't sustainable, and when it's over I will have a better relationship with food and think twice if I want to eat something UNHEALTHY because I know I won't feel better afterwards. This is clearly a PALEO diet. All the foods mentioned are forbidden on a PALEO diet. We are so attached to our food, aren't we? I agree that for most people some of the food on the list are healthy. However, it would not cause harm to eliminate these foods for one month. What I notice people commenting on is their willingness (or not) to give up the listed items for a short period. I did the whole30 program in January and it was fantastic. As other reviewers have said, this is not a diet. It is a way of eating for 30 days that is meant to help you find out if food sensitivities are contributing to ailments such as IBS, skin problems, migraines, insomnia, etc. if you do this program for 30 days and it has no affect on your symptoms, then the root cause of your problems Is probably not food. If you find, as I did, that your symptoms improve, then you can start introducing food groups back one at a time to see which ones affect you. The goal of this program is not to ban dairy, wheat, beans or anything else for the rest of your life it is an investigation to find out what might be adversely affecting your health. If your goal is only to lose weight, this program is not for you. If you are experiencing any type of ongoing health problem, you might want to give a try. It's only 30 days and you may end up feeling much better. I agree with Lisa. This diet may be just for 30 days, but I would have a hard time doing it for 30 days. I would rather cut out one food group at a time than cut out everything at once. Being a vegetarian I eat quinoa, beans, dairy, etc. to get protein in. This isn't realistic for me to do for 30 days. If other people can do it, great, but this diet, whether elimination or not, is not for me.